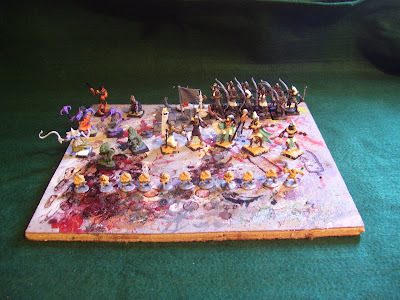 This is what is still left on my painting board, I had hoped to have the Heru characters and Archer (Tum te tum de tum...) unit painted this month. Well it's nearing the end of the month and I still haven't finished them yet, dunce's hat on the way. 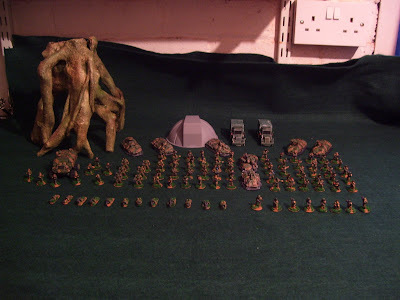 However since the two games of 15mm Sci Fi, Stargrunt II and Imperial Commander, I've been on a bit of a kick to get the rest of my 15mm figures painted. Okay so I bought a few more, thanks to Ground Zero Games for their quick delivery, the morning after ordering. 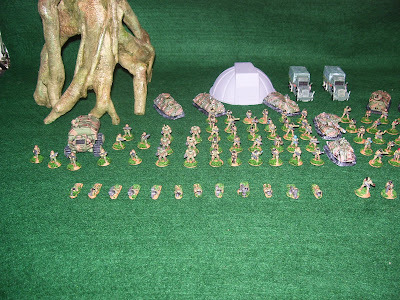 So I now have another 24 Albion Defence Force figures painted and another 3 vehicles painted. I also painted up 6 of the GZG Xenomorph aliens and 1 of the Alien Mercenaries. 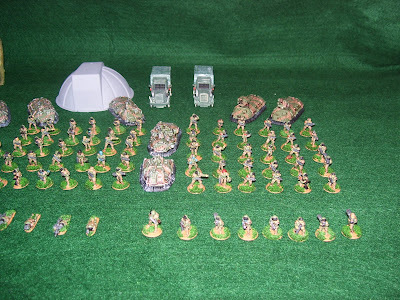 This shows the 2 new hover APCs and also two trucks, which are from the Indiana Jones toys, not bad for £1.99. Hopefully I should manage to get the Heru finished before the end of the month. Oh for a quiet life and time to paint.